This photo, from the Los Angeles Times, shows what the 340 ton rock looks like when it isn’t wrapped up in Egyptian cotton sheets and white plastic and while it was still sitting at Stone Valley Quarry in Jurupa Valley CA. I realized that I have never shown a photo of the rock in its natural state and thought some of you might like to see it. Of course, now that they have the rock at the Los Angeles Museum of Art, they have to move it from the trailer to the site of the art installation. 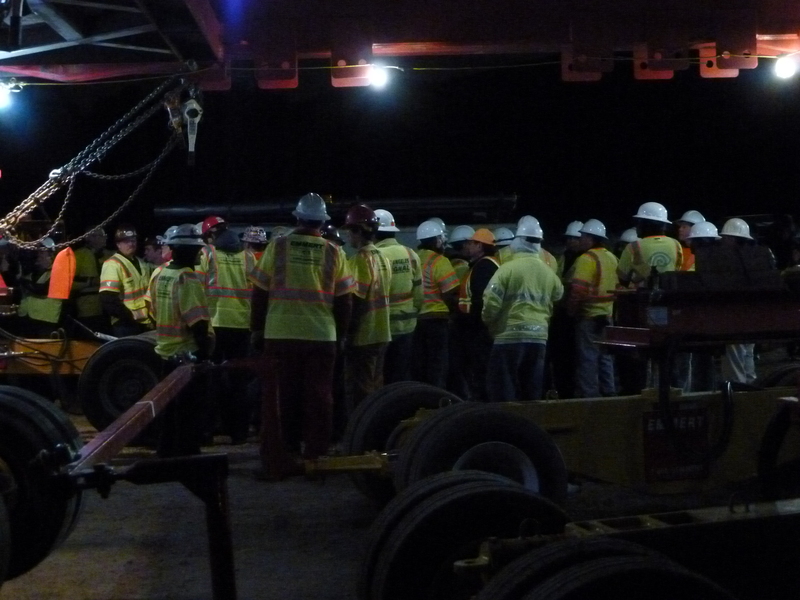 So what does it take to move a 340 ton rock? A 700 ton crane, which is being built right on the site. Below I have included a link to the LA Times site where you can see a photo of the rock and the crane going up next to it. No matter how many people contact them, we can’t seem to get through to the LA Times that the rock did NOT come from Riverside, our neighbor next door. Sigh! One more time, I am going to say it, the famous rock came from Jurupa Valley, California’s newest city! If you are tired of the rock, don’t read this! 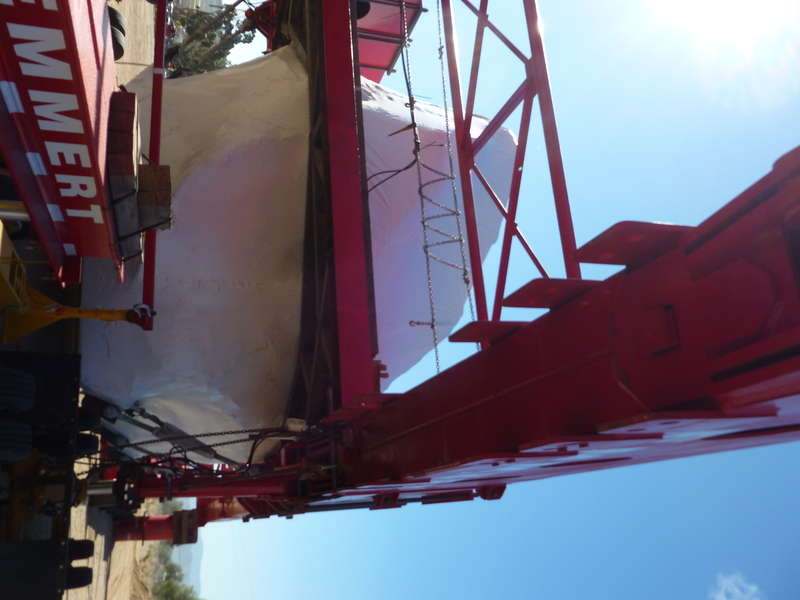 Early this morning the world-famous 340 ton rock finally reached the Los Angeles County Museum of Art. In spite of a few glitches, it did reach LACMA on time, greeting by hundreds of people. The rock has truly turned into a rock star! Sorry, but I couldn’t resist the pun! On Thursday the rock came to rest in Long Beach for the day where a block party was planned to celebrate its stop. What the organizers didn’t expect were the crowds that showed up. LACMA estimates that 20,000 people came to party by the rock! Apparently some people even dressed up in Flintstones outfits and there were clowns, jugglers, a DJ,etc…. I also learned another fact from the Los Angeles Times yesterday. Underneath that white plastic, the rock is encased in Egyptian cotton sheets to protect it from scratches. I would have thought that a rock created by dynamite might have been able to resist a few scratches…. I have already emailed the station, gently explaining that the rock is not from Riverside, but Jurupa Valley. Sigh. Someday we will be on the map! Thanks for the “heads up,” with the Giant Rock. It parked for the weekend just a few miles from our home. Dorothy, Bob, Loretta and I joined with all [or at least practically all] of Rowland Heights’ population and all the inhabitants of its surrounding cities to view the now famous moving spectacle. We must have very little to do in this area because it was totally surprising the amount of people that came to behold this new Walnut Valley attraction. But even with the large crowd, we had a fun time being part of the throng that bore witness to THE DAY THE GIANT ROCK PASSED THROUGH ROWLAND HEIGHTS. Oh Lordy, this email made me laugh. First of all, I have to like an email from anyone who loves to capitalize JUST LIKE I DO! But I also love the fact that it isn’t just the citizens of Jurupa Valley who feel a need to go see a rock. It is generating crowds wherever it goes! One thing you may not know about my city (and one of the reasons we wanted to become a city) it that we are home to many very very large warehouses. I think it is impossible for me to fully describe the largeness and the number of warehouses we have here. When you have so many, you are bound to attract a few big names such as Walmart and Costco. Very ironically, we do not have an actual Walmart or Costco (and oh how my fellow citizens want them!) but we do warehouse literally tons of their stuff. 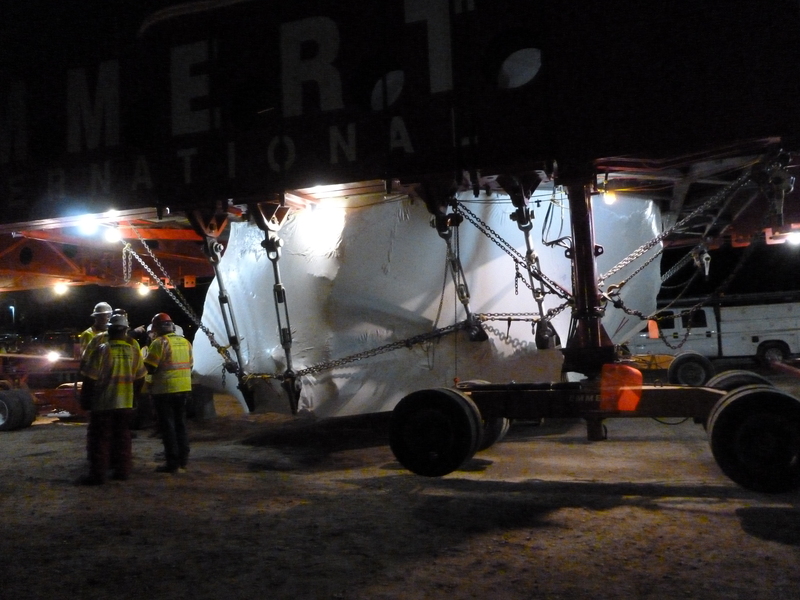 Last night the infamous 340 ton rock began its very big move to the Los Angeles County Museum of Art (LACMA) from a rock quarry in Jurupa Valley California. I think anyone who saw the number of men conferring in the hour before they set off could assume it was a logistical nightmare! I tried to take a photo of the rock and the men but my flash just lit up all the reflective strips on their vests! 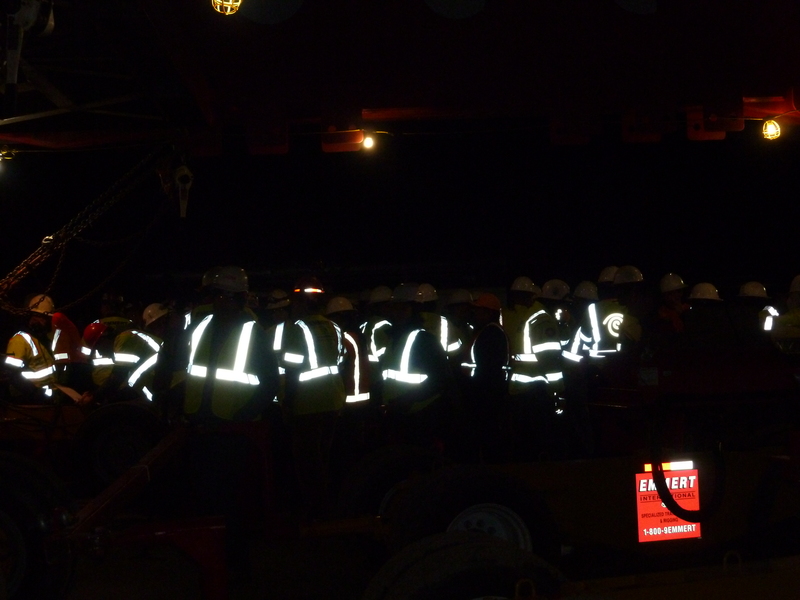 My flash captures the reflective strips on the vests of the men preparing to move the big rock. All of them were wearing the requisite construction boots on their feet, including the men who got to walk eight miles next to the rock. Hum….I have a feeling that is not going to be good….Hope those boots have arch supports! The men, without the flash! Lots of people were there and lots of news reporters were there as well. I had only been there a few minutes when I was snagged by a reporter and camera man for a Korean television station. I have a feeling I won’t be getting to see that interview! I was glad it was cold because I think the red scarf around my neck hid the double chin very nicely! I talked to a gentleman who had been out every day this past week to see the giant trailer and watch the progress of the rock being moved from the quarry out to the road, getting ready for its trip. This is a closeup of the plastic wrapped rock sitting on its trailer. The rock will only be moving about eight miles tonight. Rumor has it that Good Morning America was going to be visiting it at its resting spot this morning, just down the road and still in my fair city. While I realize that moving this rock is a bit of an engineering marvel, the thing I get the biggest kick out of is how BIG this story has become. I told Hubby that we can go see it move again tonight! Come to find out the rock will be making its way near Hubby’s work. We joked about his many, many opportunities to see that rock! When we finally dragged back home I thanked Hubby for being my rock viewing buddy. He said he would do it any time. Got to love a guy who will go with you to watch a rock move. And there it goes! 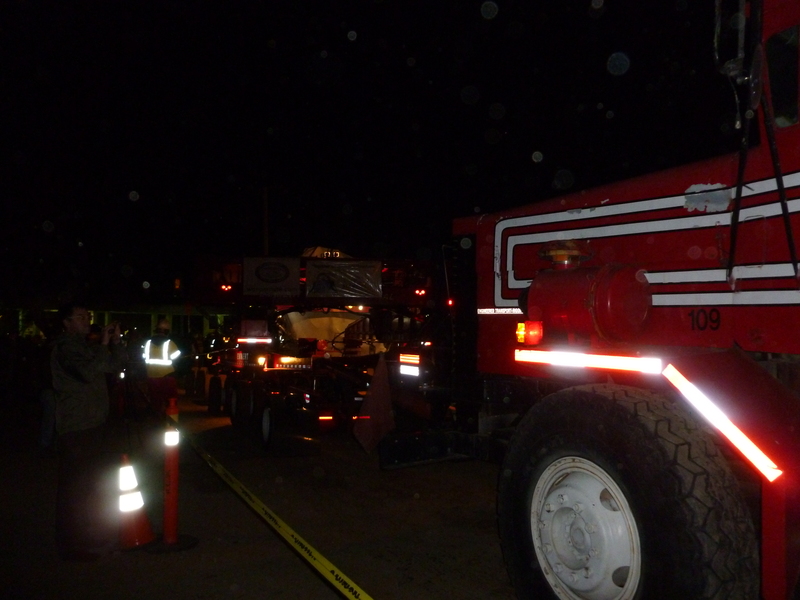 The huge trailer finally began its move at 10:30 p.m. or so. Some of you are probably wondering right about now “Why is she posting about that rock again?” Well, as shocking as this may be to some of you, this really big rock, about to begin its move from my city to Los Angeles, is really big news to some folks. So, for those of you who do not give a rip, please just ignore this post and get on with your day. I completely understand. For those of you who like the rock, read on! I guess you know where I will be tomorrow night! 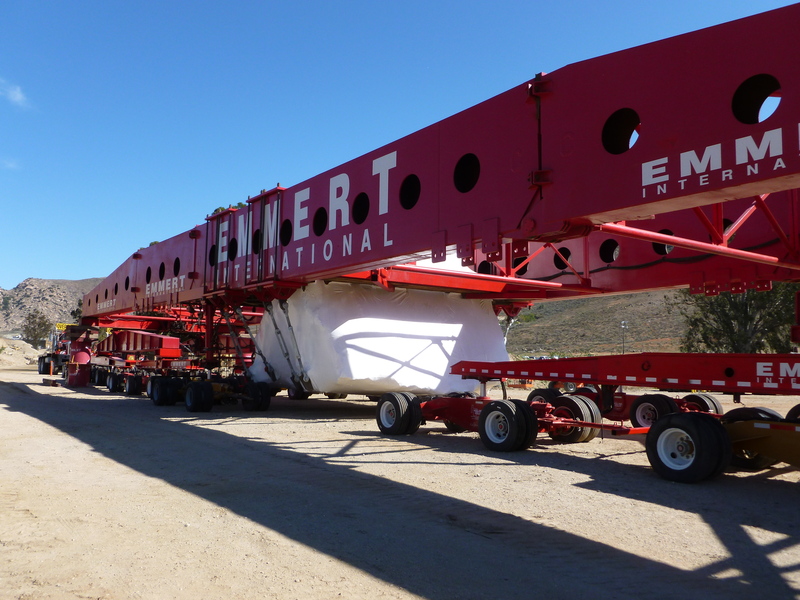 I just received word that the planned move of the 340 ton rock from the quarry in Jurupa Valley to the Los Angeles Museum of Art has been postponed from tonight (February 22nd) until February 29th. When ever that monster starts moving I plan to be there and will report on it at that time. It is amazing what will catch people’s interest. Company’s pay big money to get the attention of the public and then…out of the blue…BAM! Without even trying a news story grows legs and off it goes! That is what has happened with the 340 ton rock. What? You haven’t heard of the 340 ton rock? Just google “340 ton rock” or “340 ton boulder” and you will see stories from the Los Angeles Times, the New York Times, and all points in between. Last week I visited the Stone Valley Materials quarry, located in a geographical formation called Pyrite Canyon, in the community of Glen Avon, in my city of Jurupa Valley. The rock was selected by artist Michael Heizer to be placed in a permanent art installation at the Los Angeles County Museum of Art (LACMA) that he is calling “Levitated Mass.” The now infamous rock will have to take surface streets at night while resting in plastic wrapped glory on its specially constructed trailer. It is wrapped so no tagging can occur during its trip. It will travel no faster than 8 miles an hour for about seven miles a night. The trip will take about 9 nights to accomplish. By the way, do not believe the news reports that this rock is from Riverside. They lie. a close up of the rock sitting in plastic wrapped glory on its specially constructed trailer. I visited the quarry last week because a reporter from “California Report” wanted to see the rock but also wanted to talk to people about our new city of Jurupa Valley. I was asked to participate because I know quite a bit about the history of our area. What can I say, we all need hobbies! I was as curious as the reporter about the whole process of how the rock came to be and how the rock is getting moved. One of the interesting things I found out is that the rock is actually a mistake. When the granite is dynamited the plan is for the result to be rocks of a certain size. Those may be used as is as “riprap” for things like breakwaters, jettys, and flood control projects. They make also be broken down into a variety of increasingly smaller types of products. So, when the explosives went “boom” and this huge, 340 ton rock fell, it was not the operator’s intended result. Then the artist visited, saw the huge mistake, and the rest is history! This photo gives you some idea of how big the trailer and rig set up is that is moving the rock to LACMA. If everything goes to the current plan, the rock will begin moving February 22nd. However, the plan has changed numerous times in the last five years due to the complicated nature of this move. Here is hoping it hits the road soon! I am sure when it does you will hear about it on the news!